President Trump is about to get an earful from Americans hurt by the escalating trade war. 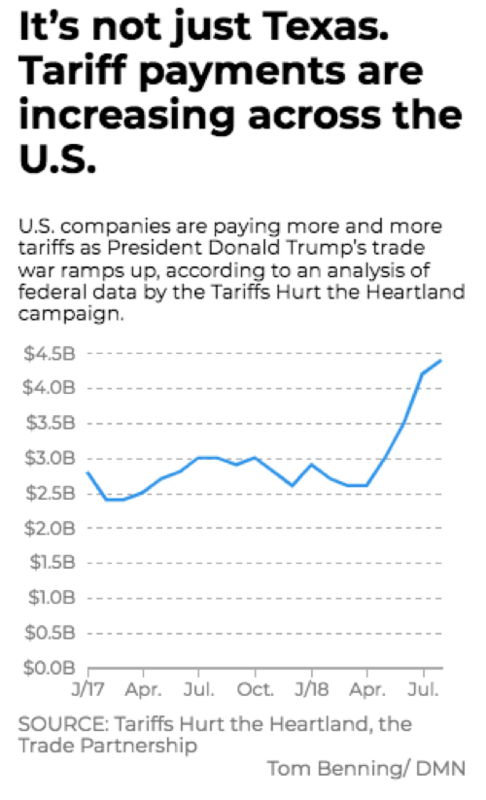 New data shows, American businesses and consumers just paid a 45% spike in duties, according to Tariffs Hurt the Heartland, a campaign that highlights the negative impacts of President Trump's trade war on US businesses and the economy. Trade data released last Thursday during a town hall meeting in Pennsylvania discussed the tariffs' impacts, featuring distillers, pork producers, frame manufactures, and other industry experts. "For the most recent months available, August 2018, the amount of tariffs paid increased by $1.4 billion -- or 45% -- as compared to tariffs paid in August 2017. Tariff costs in Michigan tripled to $178 million and more than doubled in multiple states -- to $424 million in Texas, $193 million in Illinois, $50 million in Alabama, $29 million in Oklahoma, $23 million in Louisana, and $7.3 million in West Virginia. These costs strain businesses of all sizes but are particularly painful for small business, manufacturers, and consumers who bear the burden of tariff increases in the form of higher prices," via the data compiled by The Trade Partnership and released by Tariffs Hurt the Heartland. "These tariffs are taxes on American businesses and consumers," said Tariffs Hurt the Heartland spokesperson Angela Hofmann. "They aren't paid by other countries. They are paid here at home. What this data shows is that we are already seeing a steep increase both nationally and at the state level in the tariff costs businesses and consumers are paying." "This is just the very tip of the iceberg. The data released today offers a glimpse at what the coming pain from the trade war looks like. Once the tariffs on an additional $200 billion in goods kick in -- these numbers will continue to trend sharply upward. We are hopeful that this data, combined the personal stories of harm that we're sharing across America, will encourage this administration to move away from tariffs and to find new solutions to growing access to foreign markets," Hofmann said. The graduation of the trade war, and respective GDP hit, is shown by the Bloomberg chart below. Tariffs Hurt the Heartland noted that today's trade data is showing a vicious spike in duties paid, which is only the beginning of the trade war; costs will continue to rise as the other announced tariffs go into effect. "In Pennsylvania alone, we are seeing 55% higher costs or $45 million a month for state business from last year to this year. And it's only going to get worse once additional tariffs kick in. Continuing to go down this track will only lead to more layoffs and higher prices," Hofmann said. "The steel and aluminum tariffs have had significant cost implications for the states. The section 232 steel tariffs have cost American companies an additional $1.5 billion, including $475 million in August. Previously, these products were duty-free. Imports into these states paid the most taxes for steel subject section 232 tariffs: Texas ($289 million), Michigan ($139 million), California ($104 million), Illinois ($103 million), Pennsylvania ($98 million) and Ohio ($77 million). Aluminum tariffs also hurt producers throughout the country, costing American companies more than $125 million in the month of August alone. The largest increases to existing tariffs were paid in Texas ($14 million), New York ($11 million), California ($10 million), Kentucky ($7.4 million) and Illinois ($6 million). Lastly, section 301 tariffs cost American companies roughly $550 million in August. Products subject to section 301 remedies faced $594 million in tariffs in August, compared to just $46 million in August 2017. 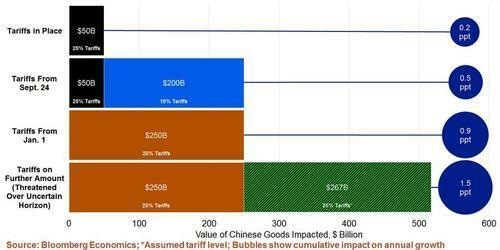 The large increase in tariffs came despite a less than 1% increase in the value of imports. Keep in mind: "List 2" tariffs did not take effect until August 23 and another batch of "List 3" tariffs will take effect in September, so tariff costs should rise significantly in future months," said the report. 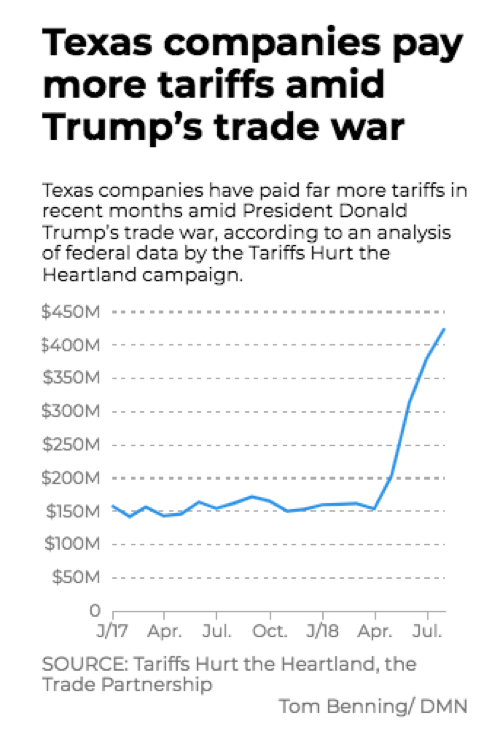 Companies in Texas have paid $654 million more in tariffs in June through August than in the same three months the prior year, a 142% increase that is a direct consequence of President Trump's escalating trade war. The impact is hurting small and medium-sized businesses. Tariffs Hurt the Heartland shows that duties are not limited to just Texas, but have affected companies and consumers across the entire country. 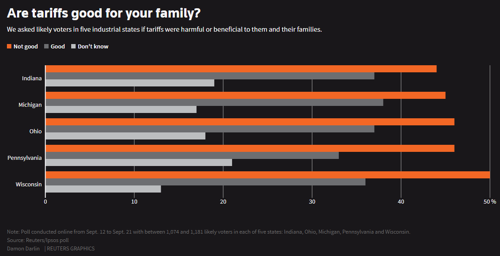 A Reuters/Ipsos poll from early Sept. shows people in each of the five industrial states: Indiana, Ohio, Michigan, Pennsylvania, and Wisconsin; overwhelmingly think President Trump's trade wars are "Not good" for their families. Earlier this month, JPMorgan Chase & Co. turned cautious on the global economy, as they warned: a "full-blown trade war" next year between China and the US is expected. It seems like trade conflict between the world's largest economies could erupt in the coming months, further straining American business and consumers, and send the world plunging into a global recession sometime in the next 12 to 16 months. "A full-blown trade war becomes our new base case scenario for 2019," JPM wrote in a recent note. "There is no clear sign of mitigating confrontation between China and the U.S. in the near term." Tariffs Hurt the Heartland ends the report with this video, letting the American people know that tariffs are nothing more than taxes. Prepare for 2019 and beyond; your taxes could jump significantly.